Segway LLC is a young firm. The first devices were delivered to private customers at the end of February, 2003. 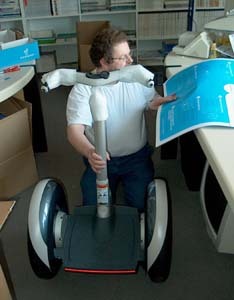 In this phase Segway is not able to serve customers out of "Old Europe." Up to now there has been no distribution, no service, and what is more an unclear legal situation. Should you ride on the sidewalk or on the street? Do you have an obligation to purchase insurance? As a result, Segway temporarily refuses to deliver to customers outside the USA. I also had to be ready to pay $5,000 up front for a product with no warranty and no repair-service, which I knew only from its description on the Internet and could inspect and try out nowhere. Besides this I needed a delivery-address in the USA and someone who could then forward the box (76 x 76 x 60 cm, 50 kg) on to Germany. When all that had been arranged, there followed on 20 November 2002 the order at www.amazon.com. It was enough to pay $495 initially and then be patient. 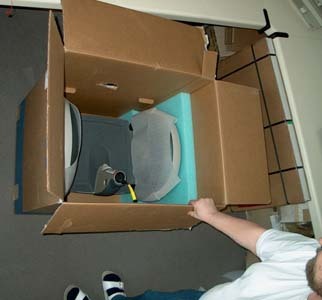 Delivery was envisioned for between March and July, 2003. The next hurdle was the required two-hour training that every customer must graduate from at one of the training centers in the USA. Without training, no delivery! But to embark on a trans-Atlantic journey only to drive around (or is that "drive over"?) a couple traffic-cones on the hotel floor? That seemed to me rather too extravagant, so I started looking on www.segwaychat.com for a volunteer who, as official representative of "Thomas Knauf, Inc." could attend training in Los Angeles on 16 March. This required a few e-mails, but the helper showed himself to be reliable and even had a great time at the training. The next hurdle was payment. I learned that it wasn't enough to simply own a valid credit card with a credit-limit above the purchase-price. If one does not regularly do business at similar volumes with similar business-partners, then the payment will run up against the "security procedures" of the credit card company. This is to head off Internet fraud. It also doesn't help at all if the credit card owner explicitly declares to the credit card company that he desires this payment to happen. Customer desires are simply disregarded. Instead of this, the payee is lead by the nose to telephone Europe to get an "approval code," and in order to do this further new, important questions are posed (What is the birthday of the credit card owner? What is the CVC code?). The patience of all involved is severely tested this way, while the crisis-afflicted telecommunications industry is helped out of its dip in sales. The next hurdle was sending it to Germany. Federal Express politely declined; the package was said to be too big. DHL accepted the goods, but took care of neither customs nor actual delivery. After an entire day at the Cologne Customs Office (from 4:32 AM until 10:35 PM), the package was finally given its customs-seal: Unauthorized Opening Punishable by Imprisonment. And the merry DHL delivery-man, after one try at delivery, took the goods back to the storage-warehouse. They reported "Receiving-office closed," even though at the receiving-dock door it is written in big letters, "NO GOODS DELIVERY ACCEPTED HERE" and a small diagram shows the correct way. 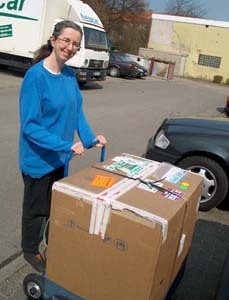 When it comes to international package-delivery, naturally not every employee is able to read signs in German. So I took to the road to Hamburg myself and picked up the package on Saturday, April 12, at DHL. And right after that (on the advice of the DHL employee) quickly to the airport for the customs approval. I should have saved myself the trouble. Mr. Elvers and his two co-workers would spend a full 45 minutes on this matter, advising, reprimanding, telephoning. Then the customs officers went into their hard-earned weekend. I now know a bit more about T1, free traffic [ed's note: These links lead to German government customs regulations, in German. Clicking on them is not recommended, as actually trying to understand them will probably lead to thorough confusion and recurring Kafkaesque nightmares. ], and submitting written application on consolidated form #0737, but my package remained sealed. That things can also be handled in a more customer-friendly way was evident on Monday at the Lübeck customs office, which helped me with the paper-war and took care of the matter speedily. The last hurdle was the missing "Welcome Kit." Normally it precedes the actual delivery, and is made up of a handbook and a safety video. Since I hadn't done the training personally, I at least wanted to learn the method of operation and safety considerations from the video. Unfortunately, as I found out through laborious inquiries, my Welcome Kit had gotten lost somewhere between Segway and the US delivery address. Segway sent a replacement after a couple of days, so that on 14 April everything was finally complete. The Segeay HT can be assembled without any problem within a few minutes. The machine and its accessories give an impression of being stable, solid, and well-thought-through. The documentation comes in the form of two small handbooks (Rider's Guide and Reference Manual) and the safety video, if I haven't missed any important information. Indeed the machine confines itself to the basic function of transport and dispenses with any other trifles (as desirable as they might be - no lights, no tachometer, no odometer, no cargo-bags to carry something in). A brisk accessory-trade could develop out of this.